(1) The Japanese stamp is certainly visible. While I wouldn't normally view that as a flaw, "The Borrowers" is a purely British tale. The characters, the setting, everything. The setting was nice, actually, although the era is wrong. (2) I don't like the American actress who voiced Arrietty. I can't remember her name. (3) My beloved Spiller was reduced to an aborigine/American Indian/caveman dude with paint on his face and a fur shawl. He barely speaks, and when he does he sounds the way people do when they mock cavemen and American Indians. It was sort of funny, but it wasn't Spiller. And it makes no sense. As a borrower, Spiller should have had no exposure to any of those cultures, and you can easily assume no other borrower around there is like that. He's completely out of character. Again, I'm spoiled. Remember when Daniel Newman was Spiller? 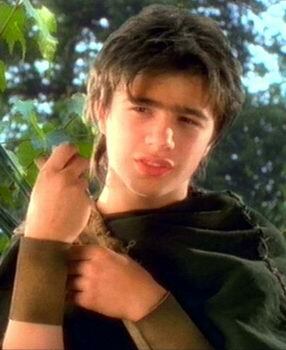 Not only did he have a presence, but he was so effing cute that every time he came on screen, you watched him. And boy did I watch him. (4) The music was bad. They kept repeating some crappy song about coming into someone's garden or something of that nature. Hated it. (5) For some reason, it lacks the right amount of charm. Perhaps this has to do with the whole British thing I mentioned above. If it had been more charming, I could forgive it more. (6) Pod...poor Pod. Spiller isn't alone in being overly changed. Pod is barely a presence in here. He hardly speaks, he grunts, and he goes missing at a vital moment. What happened to the protective father and husband with a lot of fight in him? What we get instead is a bodybuilder-esque man who prefers to brood and grunt. When Homily is abducted by the housekeeper and placed in a jar, Pod is nowhere to be found. I assume he was off searching for a route of escape for his family, but that's not the point. The point is that there was no reaction. It was as if he was never aware that his wife was kidnapped. That's a missing scene if ever there was one. 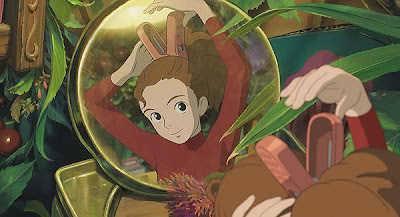 (7) I felt no connection with the characters, and no bond between Arrietty and her father. I didn't care about them as much as I should have. I could probably point out other issues I had with it, but why bother? Of course I expect changes, and I welcome some. That's why I love seeing different takes on my favorite stories. This wasn't terrible, and it has some pluses, but overall I didn't enjoy it much, and it only succeeded in making me want to re-watch the 1992 version.